Christine Blasey Ford identified Patrick J. Smyth as one of the teenagers who attended a party in the 1980s where she alleges Supreme Court nominee Brett Kavanaugh sexually assaulted her, but Smyth denies attending a party like the one Ford describes. 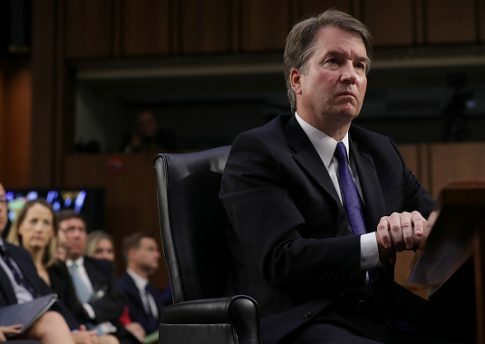 Smyth, a former classmate of Supreme Court nominee Brett Kavanaugh, said in a letter to the Senate Judiciary Committee that he does not "have any knowledge of the allegations of improper conduct [Ford] has leveled against Brett Kavanaugh," CNN reports. Ford told the Washington Post that Kavanaugh, then a junior in high school, attacked her when they were at a party in Maryland in the early 1980s. She alleged Kavanaugh forced her onto a bed, groped her, and tried to remove her clothes while he was heavily intoxicated, all while his friend Mark Judge watched. She said she managed to escape after Judge jumped on them, sending them tumbling and giving her an opportunity to get out of the room. An attorney for Smyth sent the letter to Senate Judiciary Committee Chairman Chuck Grassley (R., Iowa) and Sen. Dianne Feinstein (D., Calif.), the ranking member, in which he denied witnessing any improper conduct from Kavanaugh. "I understand that I have been identified by Dr. Christine Blasey Ford as the person she remembers as ‘PJ' who supposedly was present at the party she described in her statements to the Washington Post," Smyth says in his statement. "I am issuing this statement today to make it clear to all involved that I have no knowledge of the party in question; nor do I have any knowledge of the allegations of improper conduct she has leveled against Brett Kavanaugh." Grassley has postponed the committee vote on Kavanaugh and scheduled a hearing on Monday for Kavanaugh and Ford to testify. An attorney for Ford said her client wants an FBI investigation conducted into the allegations before she agrees to testify to the committee. The Department of Justice released a statement on Monday night saying it is not the FBI's job to judge the allegations against Kavanaugh. The nominee has gone through six FBI background checks for his work in the government. None of the background checks uncovered past wrongdoing against women. Democrats insist the FBI open an investigation to the allegation like they did with Supreme Court Justice Clarence Thomas when he was accused of sexual misconduct. The allegation against Kavanaugh doesn't describe a federal crime, however, so the FBI has no jurisdiction. In the case of the Thomas allegation, it involved two federal employees on federal property, and so the FBI did have jurisdiction. Ford, a registered Democrat, is being represented by Washington, D.C. firm Katz Marshall & Banks. Attorney Debra Katz, who has made a number of media appearances to speak on Ford's behalf, is known for her work with #MeToo accusers, the Washington Free Beacon reported. Katz is a committed "Resistance" member opposed to the Trump administration, she told the University of Wisconsin Law School alumni magazine.